Arrowhead Alpines Blog: Should we be adding charcoal to our soil? I find that soil very interesting. I have a bunch of site bookmarked for future reference. With the proper combination of soil and mycelium innoculation I think people could really do wonders for soil fertility. 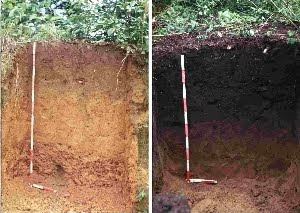 It certainly is intriguing... there is still SO much we don't know about soil. All political persuasions agree, building soil carbon is GOOD. To Hard bitten Farmers, wary of carbon regulations that only increase their costs, Building soil carbon is a savory bone, to do well while doing good. Land management & Biochar provides the tools powerful enough to cover Farming's carbon foot print while lowering cost simultaneously. Biochar allows the soil food web to build much more recalcitrant organic carbon living biomass & Glomalins Every 1 ton of Biomass yields 1/3 ton Charcoal for soil Sequestration (= to 1 Ton CO2e) + Bio-Gas & Bio-oil fuels = to 1MWh exported electricity, so is a totally virtuous, carbon negative energy cycle. Another significant aspect of low cost Biomass cook stoves that produce char is removal of BC aerosols and no respiratory disease emissions. At Scale, replacing "Three Stone" stoves the health benefits would equal eradication of Malaria. The broad smiles of 1500 subsistence farmers say it all ,that, and the size of the Biochar corn root balls. Biochar systems for Biofuels and soil carbon sequestration are so basically conservative in nature it is a shame that republicans have not seized it as a central environmental policy plank as the conservatives in Australia have; "Carbon sequestration without Taxes"
Oh I can't wait to hear more about this!!! Recent work by C. Steiner, at U of GA, showing a 52% reduction of NH3 loss when char is used as a composting accelerator. This will have profound value added consequences for the commercial composting industry by reduction of their GHG emissions and the sale of compost as a nitrogen fertilizer. Whole systems solutions based on building soil carbon take a while to filter through one’s mind to see the manifold benefits. The “Eyes Glaze Over” microbial complexity, labile verses recalcitrant carbon, Cation Exchange Capacity (CEC) etc, all conspire to slow peoples comprehension . Once thought through however, the elemental carbon nature of biochar understood, soil’s reduced GHG emissions and the local economic stimulus perceived, then can be added that beyond rectifying the Carbon Cycle, biochar systems serve the same healing function for the Nitrogen & Phosphorous Cycles, Toxicity in Soils & Sediments and cut the carbon foot print of livestock by 1/2 with a 5%Char feed ration. The production of fossil fuel free ammonia & char (SynGest, http://www.syngest.com/ ) and the 52% conservation of NH3 in composting with chars, are just the newest pathways for the highest value use of the fractionation of biomass. When I was researching NPP numbers for plugging into Biochar's climate potential, looking through Dr. Bill Ruddiman's work at UVA on legacy CO2 and the agricultural revolution, It's support of Johannes Lehmann's previous work of a potential 10 GtC sequestration, and the added perspective of palioclimatic effects of soil carbon loss, the Ruddimann Hypothesis, brought together many loose threads for me. I'm glad this work by Dr. Dull is getting attention. Together with Dr. William Woods and citing Bill Ruddiman's work, the pieces of anthropogenic climate change fall into place. The implications are really important. Dull, et al, argue that the re-growth of Neotropical forests following the Columbian encounter led to terrestrial biospheric carbon sequestration on the order of 2 to 5 GtC, thereby contributing to the well-documented decrease in atmospheric C recorded in Antarctic ice cores from about 1500 through 1750. While the paper does not extend to the medieval maximum, from charcoal in lake bed studies it documents increased biomass burning and deforestation during agricultural and population expansion in the Neotropics from 2500 to 500 years BP, which would correspond with atmospheric carbon loading and global warming 1100 to 650 years BP. Dr.Dull gives us hard numbers for what Charles Mann has tried to get across to us in "1491", that we don't give mankind near enough credit for creating our biosphere. Just as Michael Pollan's "Botany of Desire" showed us how plants have manipulated us to spread them around the globe, the message of man's mutuality with nature is more than seeping into the data everywhere. For a complete review of the current science & industry applications of Biochar please see my 2013 Umass Biochar presentation. How thermal conversion technologies can integrate and optimize the recycling of valuable nutrients while providing energy and building soil carbon, I believe it brings together both sides of climate beliefs. A reconciling of both Gods' and mans' controlling hands.